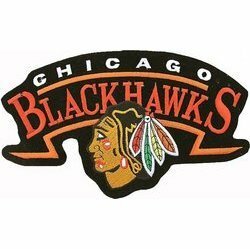 The Indian head logo of the Chicago Blackhawks National Hockey League team has been called the coolest logo in professional sports. One of the most iconic logos in all of professional sports is the Indian head logo of the National Hockey League’s Chicago Blackhawks, one of the Original Six teams of the NHL, which first took to the ice in 1926. The multicolor Indian head called the “coolest logo in sports,” by football coach and TV analyst John Madden, is immortalized by countless embroidered patch images. The Blackhawk logo has changed little over the years, retaining it’s original design. The team actually got it’s name from a World War I machine gun battalion, which was named for an Indian chief, Chief Blackhawk. Originally the called Portland Rose Buds, the team was moved to Chicago by owner Frederick McLaughlin (who as a US Army major was a commander of the military unit) and the Native American profile, complete with feathers in his hair, was created by McLaughlin’s wife, Irene Castle. 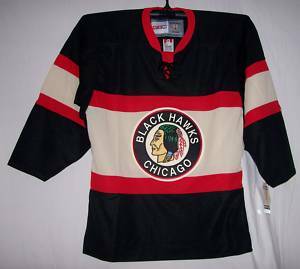 This “throwback” jersey features one of the few variations of the Blackhawks logo. The logo has only undergone minimal changes from the original image, with the facial features softened and a fierce face expression softened with more of a smile. 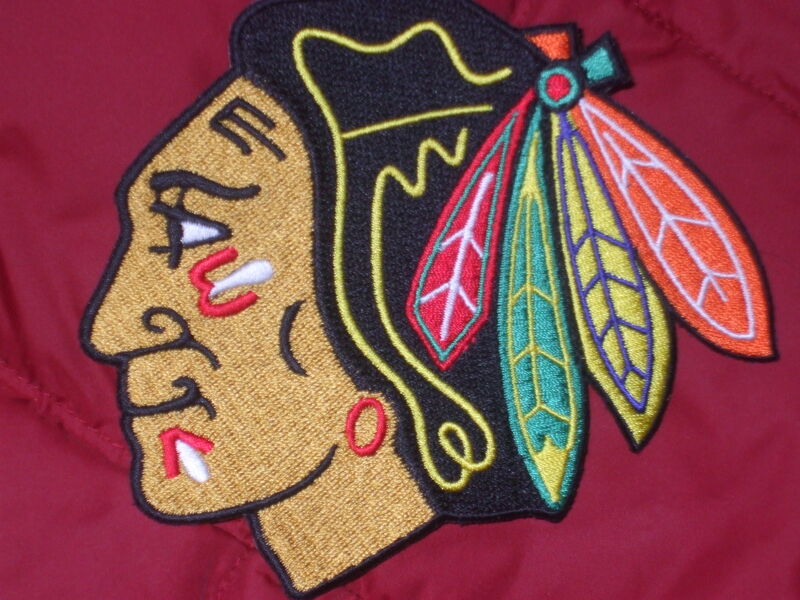 For two seasons, 1935-36 and 1936-37, the logo had redder skin on the face. 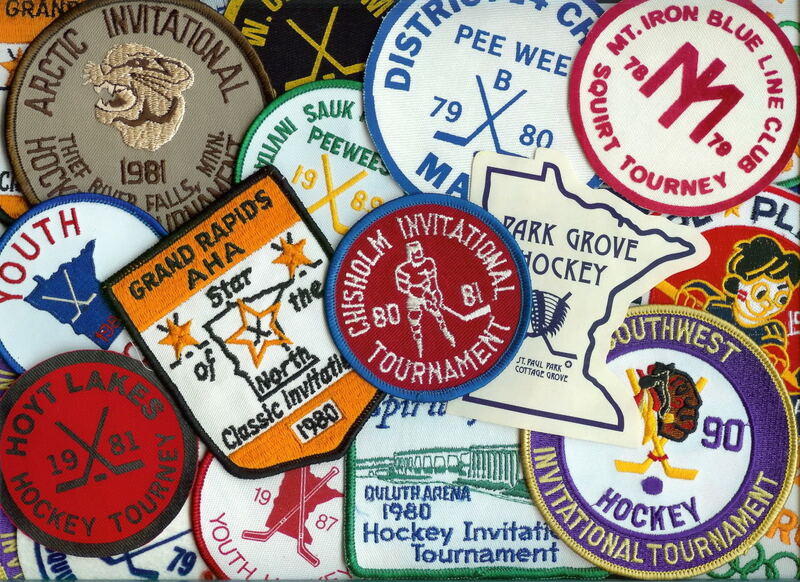 Original patches with these previous designs are rare and coveted by collectors of embroidered patches. 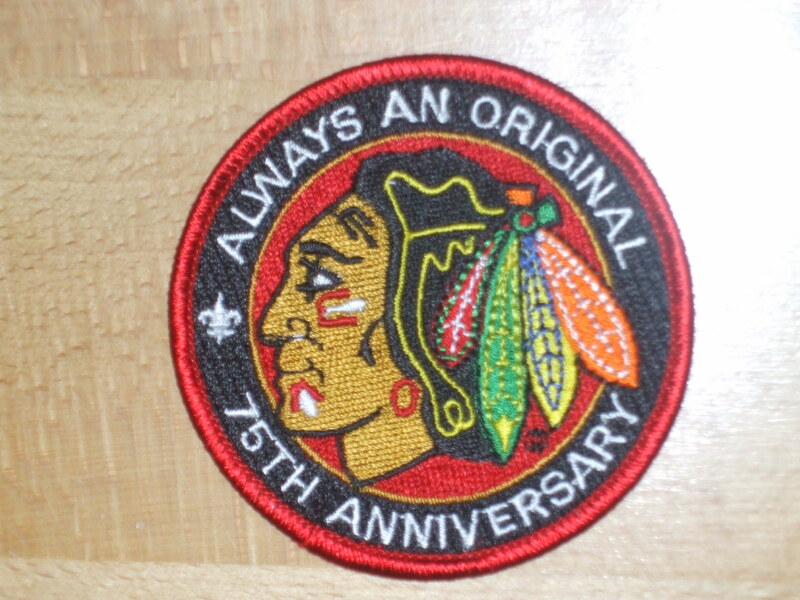 For many years, the Chicago Embroidery Company made the Black Hawk patches. The crossed tomahawks patch, worn on the shoulder of the Hawks jerseys (true hockey fans call it a “sweater”) is a secondary logo for the team. 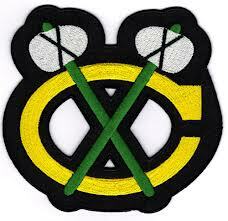 A secondary logo patch, two crossed tomahawks with the letter “C,” is worn by players on the shoulder of their jerseys, commonly known as “sweaters” in hockey parlance. Technically, the team has actually had two names; Blackhawks, and prior to 1986, Black Hawks. Established in 1926, the Chicago Blackhawks are one of the Original Six franchises of the NHL. The professional hockey team’s image has avoided much of the controversy faced by other sports teams and college mascots using Native American imagery (Cleveland Indians, Atlanta Braves, the University of South Dakota Fighting Sioux, University of Illinois Chief Illiniwek and many others) due to the iconic, long-lasting design and the respect for the image garnered by the team and its players. A large Indian head is prominently featured on the carpet in Hawks locker room, but woe to the novice visitor who sets foot on the image. Other Original Six teams (Montreal Canadiens, Toronto Maple Leafs, Boston Bruins, New York Rangers and Detroit Red Wings) may have larger, more rabid fan bases, but none have a cooler logo. From youth leagues to the NHL, embroidered patches are an important part of a hockey player’s uniform. From a 5 yr.-old Mite league player, ice skating and playing hockey for the first time, to a National Hockey League (NHL) superstar flashing down the ice, hockey players share a common uniform trait – embroidered patches. 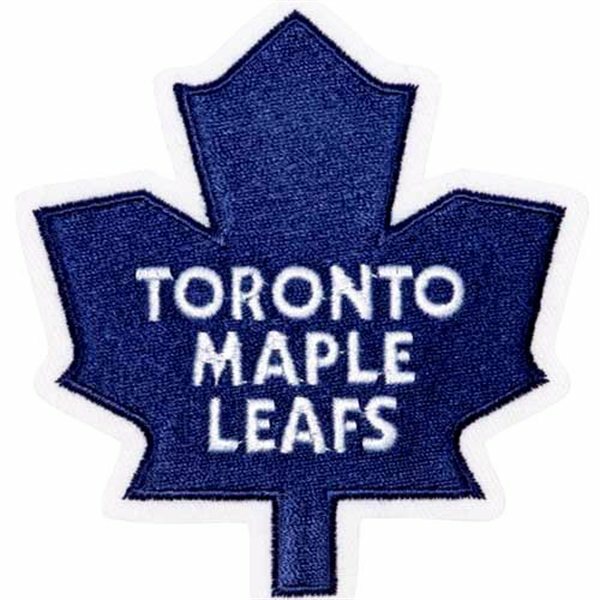 The popular die-cut Toronto Maple Leafs patch is an icon from one of the National Hockey League’s “Original Six” teams. Youth leagues, including the aforementioned Mite, plus Squirt, Bantam, and others, on to high school teams, the extensive junior hockey system in Canada (and around the world), professional minor league hockey and the NHL all use embroidered patches to signify their teams and promote their image among fans and supporters. 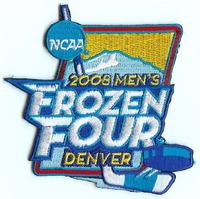 Participants in the NCAA collegiate hockey championship, known as the “Frozen Four,” proudly wear an embroidered patch on their sweaters (don’t call them jerseys!). 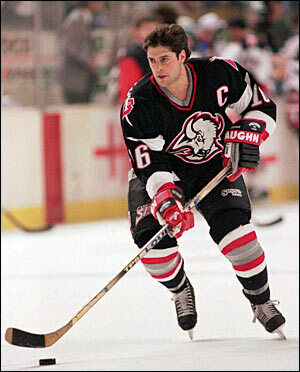 Embroidered “C” patch on this player’s jersey /sweater denotes the team captain. Hockey jerseys, known as” sweaters” by truly dedicated players, can feature embroidered patches on the point of the shoulder, the chest, front upper shoulders and even on back. Commemoration of championships, team names, secondary logos, participation in Final Four and other tournaments ( the NCAA Championship is known as the Frozen Four), all-star games and other hockey events are depicted on multi-colored embroidered patches. Hockey’s team captains and assistant captains wear a prominent “C” or “A” patch on the upper front shoulder of their sweater. 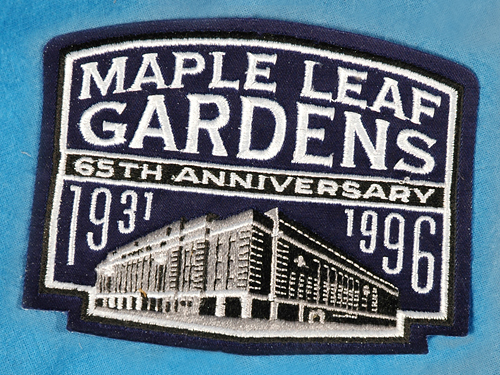 Not just the team, even the hockey venue can be immortalized in an embroidered patch. Chicago Embroidery Company works with numerous hockey teams, developing an image that is manufactured into vibrant embroidered patches. Durable polyester threads provide bright colors to work with.